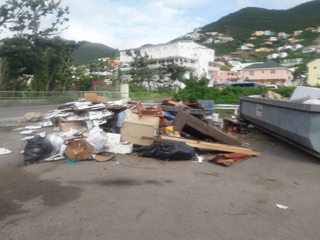 Philipsburg – The Ministry of VROMI is very disappointed that persons found it fit to dump a huge amount of garbage on the parking lot of the Jose Lake Cooper ballfield which has already been cleaned up fully and disinfected. The ministry has requested all contractors and residents to please make use of the sanitary landfill. The continuous illegal dumping of garbage all over the place doesn’t help the island regain a clean status which is very important for our touristic product and our over social and hygienic well-being.